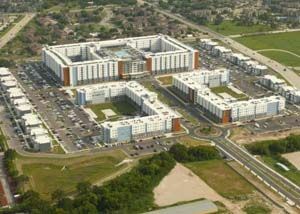 Park West is the largest student housing project in the country, with 3,406 beds on the west side of the Texas A&M campus in College Station, TX. The project completed on time and opened to residents in the fall of 2017. The luxury student housing community consists of studio, one, two, three and four bedroom apartment configurations. At the center of the complex, an eight-story building includes a central parking garage, amenity deck and fitness center. Additional beds are in two five-story mirrored buildings and several townhome style flats around the perimeter of the complex.